Make your amp scream like a banshee. Conceived in the dark depths of Kirk Hammett’s mind, an iconic circuit has been pushed to perfection and equipped with five switches to give you the ultimate control over your tone. The KHDK Ghoul Screamer is a multipurpose pedal, a true utility knife of overdrives. The dramatic versatility of the controls spans from a clean boost all the way to a massive overdrive. In addition to the three standard controls (Drive, Tone, Volume) five mini toggle switches have been added, offering enhancement for Bass, Highs, and Body, as well as two variations of Compression. 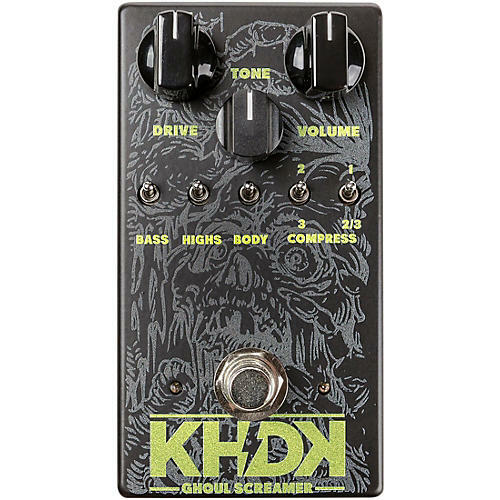 This hugely enhances your sound palette and elevates the KHDK Ghoul Screamer to the highest class of stage and studio gear. The ghoulish face on the pedal's enclosure was created by San Francisco's tattoo artist Tim Lehi. Like all KHDK pedals, the Ghoul Screamer is proudly handcrafted and quality-tested in Kentucky, USA. Drive controls the gain of the circuit. On lower Drive settings, the Ghoul Screamer works as a clean boost with a characteristic mid hump. For more distortion turn the Drive control higher to increase the harmonics, compression and power. Volume controls the overall output volume of the Ghoul Screamer. Tone a very effective active high-frequency tone control. At 12 o’clock it’s neutral. Turned clockwise it becomes raw, aggressive and helps your tone cut through. Turned counterclockwise it cuts the highs for a more mellow and warm tone. Bass switch when activated, it enhances the low frequencies, thickens the tone and adds a massive bottom end. Ideal for instruments with a sharp tone and a weaker output. High switch expands the Tone potentiometer to reach towards higher frequencies, enhancing the brilliance and the clean tonal quality and helps less sharp instruments to be heard. Body switch improves the tonal response in the mids as well as the tightness and penetration of your tone in the mix. This mode is particularly effective when used with low tuned or seven-string guitars. Compression switches select between three types of tonal character and compression. The lowest setting (1) offers a soft and warm compression, reminiscent of vintage pedals. The highest setting (3) offers a transparent tone with an aggressive expression rich in harmonics. The compression and tone are reminiscent of an iconic modified British stack. The medium setting offers a balanced blend of modes (1) and (3). The different compression modes will change your output volume, use your Volume control to adjust. Footswitch engages your Ghoul Screamer to “on” or True bypass mode.